Gary A. Taubes M.S.E., M.S. Award Year: 2008 Over the last 150 years, Americans have increased their intake of sugar and high-fructose corn syrup (HFCS) dramatically, so that caloric sweeteners now comprise 20 to 25 percent of the calories we consume. While most experts agree that such large amounts of either sugar or HFCS are bad for our health and should be avoided, we still don't know if they can lead to obesity, diabetes, and heart disease. 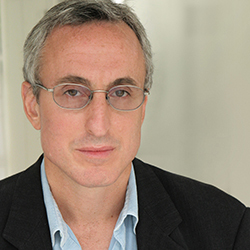 Gary Taubes, M.S.E., M.A. seeks to learn more about the possible relationship between excess consumption of sweeteners and chronic health problems and about how special interests may have influenced research and policy development in this area. In The Sweetening of a Nation: The History, Politics, and Health-Effects of Sugar and HFCS, Mr. Taubes investigates not only past research on the health effects of sugar consumption, but how the Western diet became saturated with caloric sweeteners to begin with, and how industry and other special interests may have thwarted government efforts to rein in sugar consumption and limit scientific inquiry. Mr. Taubes' investigation should enhance the knowledge we need to develop a fuller range of policy options that protect Americans' health and more adequately address the epidemics of obesity and diabetes. Gary A. Taubes is the author of Good Calories, Bad Calories: Challenging the Conventional Wisdom on Diet, Weight Control and Disease. He is a co-founder of the Nutrition Science Initiative. Taubes graduated from Harvard College in 1977 with an S.B. degree in applied physics, and received an M.S. degree in engineering from Stanford University (1978) and in journalism from Columbia University (1981). He began writing and reporting on science and medicine for Discover magazine in 1982. He has been a contributing correspondent for the journal Science since 1993, and has contributed articles as a free-lancer to The Atlantic Monthly, The New York Times Magazine, Esquire, Slate, and numerous other publications. He is also the author of Nobel Dreams (Random House 1987) and Bad Science (Random House, 1993), a New York Times Notable Book and a finalist for the Los Angeles Times Book Awards. Since the mid-1980s, Taubes has focused his reporting on controversial science and the tools and methodology needed to establish reliable knowledge. For the past 15 years, he has concentrated specifically on the intersection of science, health and public policy. He has won numerous awards for his reporting including the International Health Reporting Award from the Pan American Health Organization and the National Association of Science Writers Science in Society Journalism Award three times - the only print journalist to ever do so - for articles in Science on observational epidemiology, and on the controversies over salt and blood pressure and dietary fat and heart disease. His latest book, Good Calories, Bad Calories (Knopf, 2007), has been both justly controversial and critically acclaimed. The New York Times Book Review described the book as "eye-opening." The Washington Post called it "at times brilliant and enlightening." The historian of science Richard Rhodes, a winner of the Pulitzer Prize and the National Book Award, has called the book "easily the most important book on diet and health to be published in the past one hundred years." Taubes, G., Couzens, C.K. Sweet Little Lies. Mother Jones, November/December 2012, 34-40.